Wikimedia Commons has media related to 1071 . Year 1071 ( MLXXI ) was a common year starting on Saturday (link will display the full calendar) of the Julian calendar. The Battle of Manzikert was fought between the Byzantine Empire and the Seljuk Empire on 26 August 1071 near Manzikert, theme of Iberia. The decisive defeat of the Byzantine army and the capture of the Emperor Romanos IV Diogenes played an important role in undermining Byzantine authority in Anatolia and Armenia, and allowed for the gradual Turkification of Anatolia. Many of the Turks, who had been, during the 11th century, travelling westward, saw the victory at Manzikert as an entrance to Asia Minor. The Battle of Cassel was fought on 22 February 1071 between Robert I of Flanders and his nephew, Arnulf III. 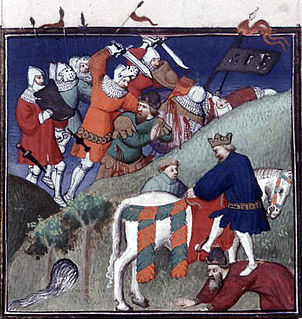 The battle was a victory for Robert, and Arnulf was killed in the battle. Hereward the Wake, , was an Anglo-Saxon nobleman and a leader of local resistance to the Norman Conquest of England. His base, when leading the rebellion against the Norman rulers, was the Isle of Ely in East Anglia. According to legend he roamed the Fens, covering North Cambridgeshire, Southern Lincolnshire and West Norfolk, leading popular opposition to William the Conqueror. Morcar was the son of Ælfgār and brother of Ēadwine. He was the earl of Northumbria from 1065 to 1066, when he was replaced by William the Conqueror with Copsi. Zaynab an-Nafzāwiyyah, was a Berber woman of influence in the early days of the Almoravid Berber empire which gained control of Morocco, Algeria, and parts of Spain. Yusuf ibn Tashfin also, Tashafin, Teshufin; or Yusuf was leader of the Berber Moroccan Almoravid empire. He co-founded the city of Marrakesh and led the Muslim forces in the Battle of Zallaqa/Sagrajas. 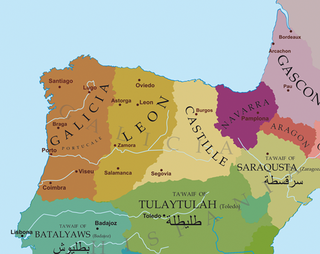 Ibn Tashfin came to al-Andalus from Africa to help the Muslims fight against Alfonso VI, eventually achieving victory and promoting an Islamic system in the region. He was married to Zainab al-Nafzawiyya, whom he reportedly trusted politically. October 22 is the 295th day of the year in the Gregorian calendar. There are 70 days remaining until the end of the year. 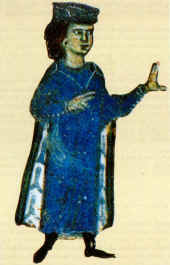 William IX, called the Troubador, was the Duke of Aquitaine and Gascony and Count of Poitou between 1086 and his death. He was also one of the leaders of the Crusade of 1101. Though his political and military achievements have a certain historical importance, he is best known as the earliest troubadour — a vernacular lyric poet in the Occitan language — whose work survived. Alp Arslan, real name Muhammad bin Dawud Chaghri, was the second Sultan of the Seljuk Empire and great-grandson of Seljuk, the eponymous founder of the dynasty. As Sultan, Alp Arslan greatly expanded Seljuk territory and consolidated power, defeating rivals to his south and northwest. His victory over the Byzantines at the Battle of Manzikert in 1071 ushered in the Turkish settlement of Anatolia. For his military prowess and fighting skills he obtained the name Alp Arslan, which means "Heroic Lion" in Turkish. The 1070s was a decade of the Julian Calendar which began on January 1, 1070, and ended on December 31, 1079. The 1060s was a decade of the Julian Calendar which began on January 1, 1060, and ended on December 31, 1069. Year 1118 (MCXVIII) was a common year starting on Tuesday of the Julian calendar. Year 1059 (MLIX) was a common year starting on Friday of the Julian calendar. Year 1064 (MLXIV) was a leap year starting on Thursday of the Julian calendar. Year 1065 (MLXV) was a common year starting on Saturday of the Julian calendar. Year 1069 (MLXIX) was a common year starting on Thursday of the Julian calendar. Michael VII Doukas or Dukas/Ducas, nicknamed Parapinakes, was Byzantine emperor from 1071 to 1078. Constantine X Doukas or Dukas, Latinised as Ducas was Byzantine Emperor from 1059 to 1067. He was the founder and first ruling member of the short-lived Doukid dynasty. During his reign, the Normans took over much of the remaining Byzantine territories in Italy while in the Balkans the Hungarians occupied Belgrade. He also suffered defeats against the Seljuk sultan Alp Arslan. Andronikos Doukas, Latinized as Andronicus Ducas, was a protovestiarios and protoproedros of the Byzantine Empire. The Byzantine Empire was ruled by emperors of the Doukas dynasty between 1059 and 1081. There are six emperors and co-emperors of this period: the dynasty's founder, Emperor Constantine X Doukas, his brother John Doukas, katepano and later Caesar, Romanos IV Diogenes, Constantine's son Michael VII Doukas, Michael's son and co-emperor Constantine Doukas, and finally Nikephoros III Botaneiates, who claimed descent from the Phokas family. Rashid al-Dawla Mahmud, full name Mahmud bin Shibl al-Dawla Nasr bin Salih bin Mirdas, also known as Abu Salama Mahmud bin Nasr bin Salih, was the Mirdasid emir of Aleppo from 1060 to 1061 and again from 1065 until his death. ↑ Kleinhenz, Christopher (2010). Medieval Italy: an encyclopedia. New York: Routledge. p. 95. ISBN 0-415-93930-5.